It's invisible, and it's dangerous. Osteoporosis, which causes bones to become weak and fragile, only reveals itself when a bone breaks. In older adults that first 'fragility fracture' is often a broken wrist, or sudden back pain due to undetected vertebral fractures. Sadly, the first fracture is often not the last - unless treated, a cascade of more debilitating fractures can occur. Today, on World Osteoporosis Day, the call to 'Love Your bones - Protect your future' by the International Osteoporosis Foundation (IOF) and its 240 member societies worldwide, emphasizes the importance of early prevention as the key to healthy mobility at older age. Fractures due to osteoporosis represent a major healthcare burden, causing disability, premature death, and loss of independence in seniors worldwide. Globally, one in three women and one five men over the age of 50 will suffer a fragility fracture in their remaining lifetimes. 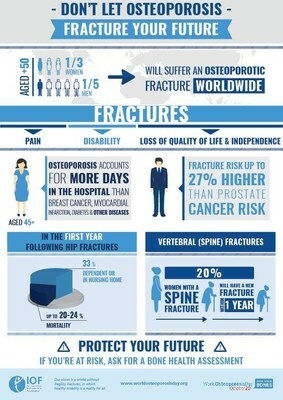 IOF President Professor Cyrus Cooper stated: "Osteoporosis is a disease which suffers from serious neglect. Despite widely available diagnostic tools and effective medications, only a minority of people at high risk of fractures are actually diagnosed and treated. As many as 80% of older adults who suffer a first fragility fracture - and are in extreme danger of sustaining more fractures - do not go on to receive preventative treatment to protect themselves against the high probability of secondary fractures." Hip fractures in particular can be life-threatening: approximately 20-24% of hip fracture patients die within the year after the fracture; 33% become dependent or in a nursing home. Due to the growth of the ageing population, the numbers of hip fractures are rising exponentially. From 1990 to 2050 hip fractures are projected to increase by 310% in men and 240% in women. To improve understanding of this public health threat, IOF has today issued a new resource, 'The IOF Compendium of Osteoporosis'. This comprehensive reference provides concise information about the disease, its prevention, and its prevalence in all regions of the world. It also outlines key strategies to fight osteoporosis at the national level, providing a blueprint for eight priority actions. One of the priorities is the implementation of Fracture Liaison Services (FLS) in all hospitals that treat fracture patients. Such services are proven to be cost effective ways to prevent secondary fractures in these high risk patients. IOF also calls on everyone who is concerned about osteoporosis patient rights to sign the online IOF Global Patient Charter. The Charter urges governments and health authorities around the world to make bone health a priority healthcare issue. The IOF President adds: "Prevention is key. At all ages, a healthy lifestyle with good nutrition and regular physical activity lays the foundation for good bone health. As well, I urge all older adults to be aware of any personal risk factors for osteoporosis. These can include a broken bone after the age of 50, parental history of osteoporosis or hip fracture, loss of height, smoking, being underweight, certain diseases such as rheumatoid arthritis, or use of medications that cause bone loss (such as glucocorticoids). If you have risk factors, be sure to talk to you doctor and ask for testing."